Inspired by A Better Bounce Card and ggjoser's softbox projects, I decided to make something similar. What I wound up with, though, was a bit better than those projects, so I thought I'd write it up so other people could try out the same ideas. My bounce system works like a LumiQuest softbox, a Better Bounce Card, and a Sto-Fen Omni-Bounce all rolled into one. Best of all, it costs only a few dollars to make! Two sheets of fun foam or equivalent, roughly 8.5x11in or 22.5x30cm. These cost about 33 cents each at Wal-Mart or an art supply store (call ahead, because not all stores carry them). My local Wal-Mart was out of stock, so I bought a $6 pack of 30x45cm sheets in multiple colors, cut two sheets in half to make bouncers, and gave the rest to my daughter for crafts projects. 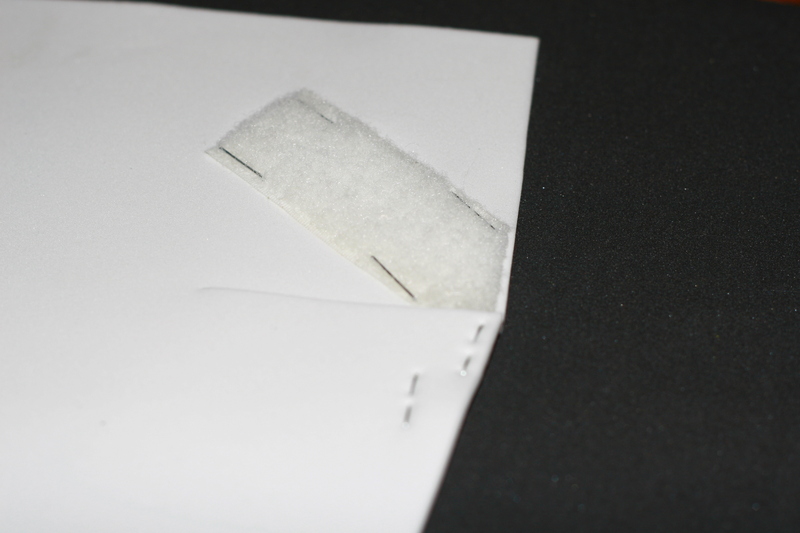 4-6 inches (10-15 cm) of white hook-and-loop fastener strips (Velcro). Actually, you need that much loop material, but only need about 1 cm of hooks. The strips should be about 1/2 inch (1 cm) wide. A stapler and staples, or glue that's appropriate for gluing the hook-and-loop material to the fun foam. The glue will look nicer, but I went with the security of the staples. In addition, it's nice (but not necessary) to have a rotary-blade paper cutter for making straight cuts. 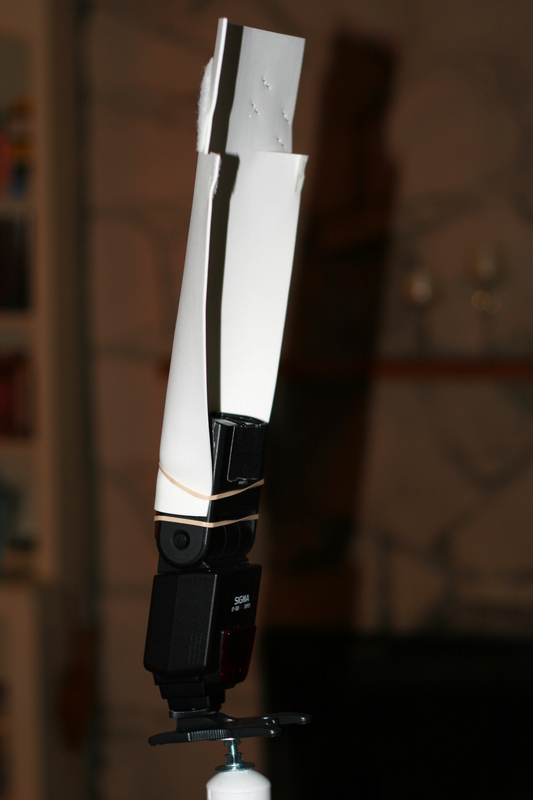 I started out by making a prototype from a sheet of white paper. That allowed me to get the dimensions correct and be sure everything was going to work out. Using a black pen, make very small marks on the white foam in preparation for cutting. The cuts will be similar to those used to make A Better Bounce Card, except that the cut will end about 3 inches (7,5cm) from what will become the top of the softbox. The marks at what will become the bottom (narrowest part) of the softbox should be placed such that the foam will just barely wrap around three sides of the flash unit. Use your white paper to make sure you get it correct, and try your flash in both the "long" and "wide" modes. For my Sigma EF-500 DG Super, and with the 22.5-cm-wide foam, my marks were 1-5/8 inches in from the edge. The very bad photo at right has random pieces of paper placed on top of the foam to show where the marks were made. 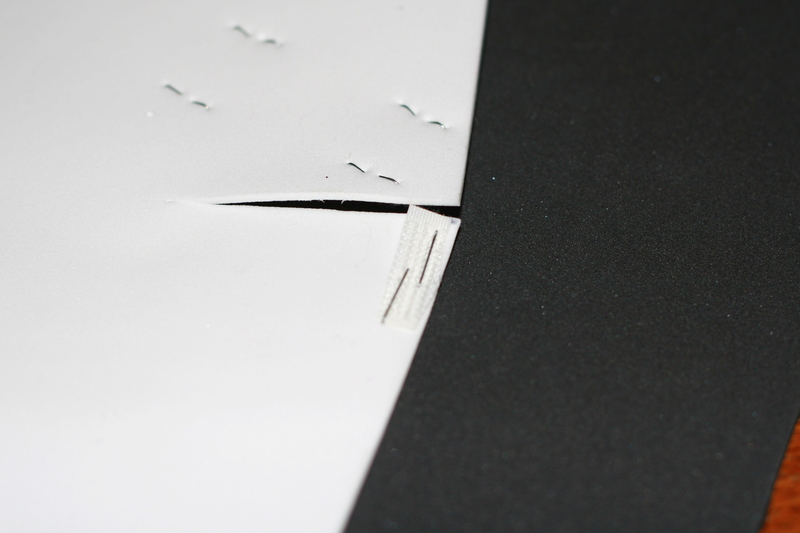 The cut will follow the triangular paper at the left of the photo. Cut as straight a line as possible between your marks, again following the general design of A Better Bounce Card but ending before the top of the card. See the second photo at right. Repeat the same cuts on the black foam. I found that my black pen made a visible mark that I could use to guide my cuts. 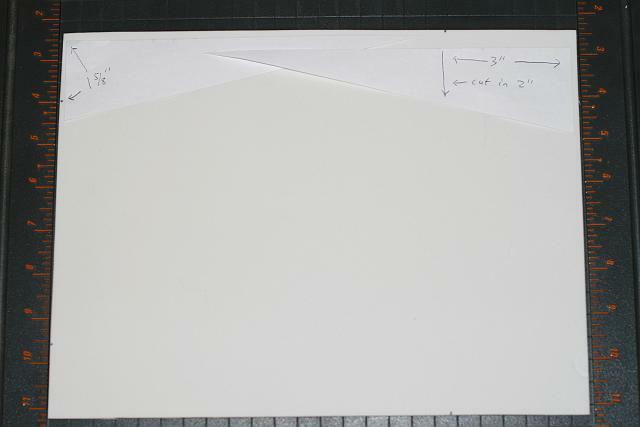 Starting from the place where your previous cuts ended on the white sheet (3 inches or 7,5 cm from the wide part of the foam), cut 2 inches (5 cm) inward. 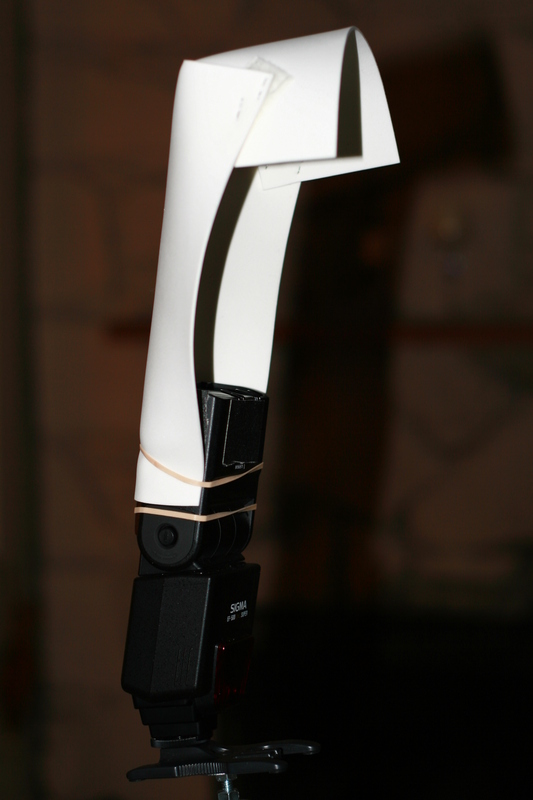 Using staples or glue, attach a very small piece of fastener hooks just below the inward cuts (see photo). These hooks will be used to hold the top of the box down. Turn the white foam over, and using staples or glue, attach a longer strip of fastener loops at an angle above the cuts. To determine the length, fold the upper part of the sheet down at a 90-degree angle (see usage photos below) and mark where the hooks will need to attach. Try the fold at several angles to ensure that the hooks will always be able to engage the loops. Trim the loops so that they neatly fit the corner of the foam. If your catchlights are too bright, you can reduce the amount of light sent forward by simply folding the bouncer back. 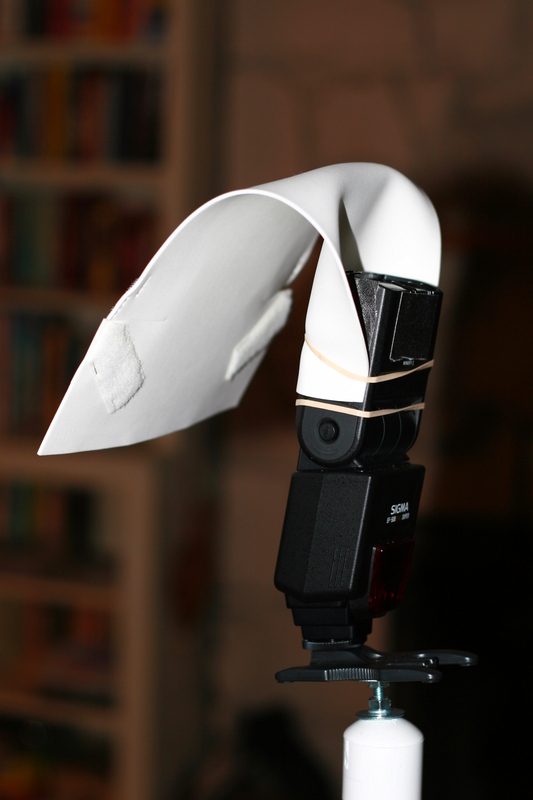 By folding the top of the foam forward and fastening it with the hooks and loops, you can make a softbox similar to a LumiQuest. You can set the top at various angles to control how the light is distributed. 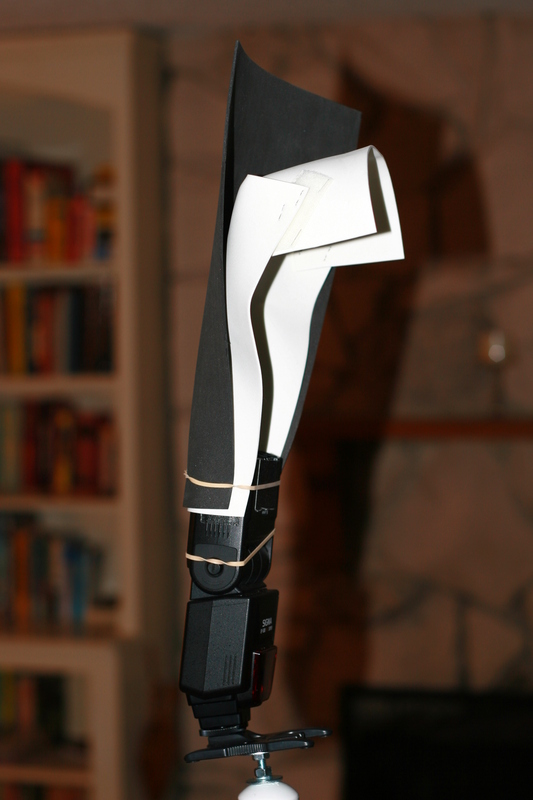 By folding the entire softbox forward, tucking the front end under the rubber band, and closing it up with the hook-and-loop fasteners, you get an effect like the Sto-Fen Omni-Bounce. 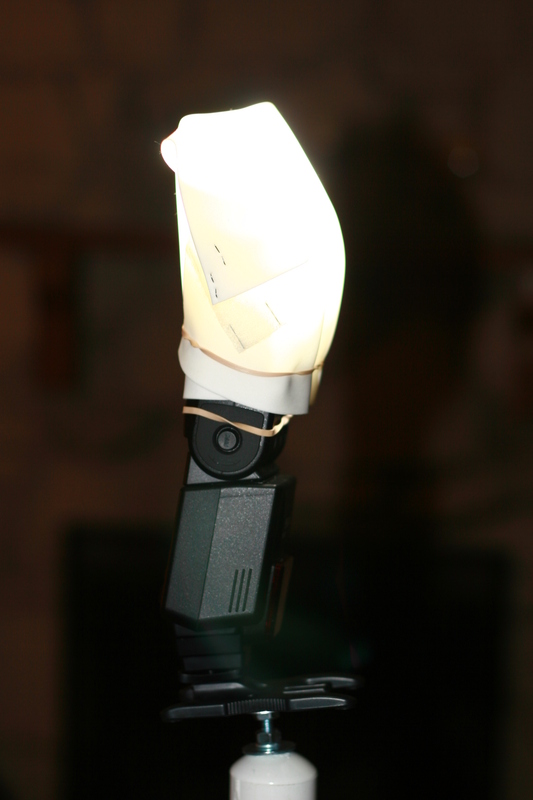 Here, I've set the flash unit at low power to show how the light is diffused. If you're in a situation (such as a wedding) where the light diffusing through the back of your bouncer is objectionable, simply rubber-band the black foam behind the white sheet. 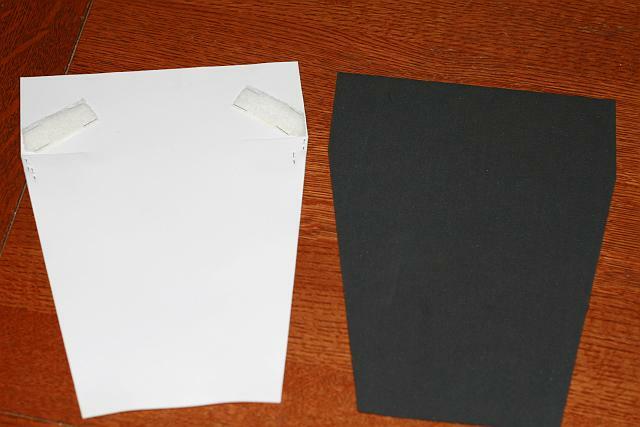 There is no need to make special folds in the black foam; simply let it stick up straight while you adjust the white foam according to your needs. This page is maintained by Geoff Kuenning.